Originally planned for the early hours of 16 December, Operation Stösser was delayed for a day because of bad weather and fuel shortages. 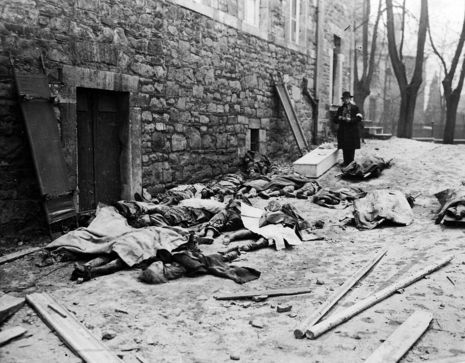 The new drop time was set for 03:00 on 17 December; their drop zone was 7 miles (11 km) north of Malmedy and their target was the "Baraque Michel" crossroads. Von der Heydte and his men were to take it and hold it for approximately twenty-four hours until being relieved by the 12th SS Panzer Division, thereby hampering the Allied flow of reinforcements and supplies into the area. Just after midnight on 17 December, 112 Ju 52 transport planes with around 1,300 Fallschirmjägern took off amid a powerful snowstorm, with strong winds and extensive low cloud cover. As a result, many planes went off course, and men were dropped as far as a dozen kilometres away from the intended drop zone, with only a fraction of the force landing near it. Strong winds also took off-target those paratroopers whose planes were relatively close to the intended drop zone and made their landings far rougher. By noon, a group of around 300 managed to assemble, but this force was too small and too weak to counter the Allies. Colonel von der Heydte abandoned plans to take the crossroads and instead ordered his men to harass the Allied troops in the vicinity with guerrilla-like actions. 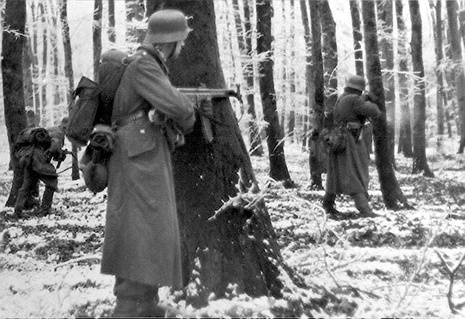 Because of the extensive dispersal of the jump, with Fallschirmjägern being reported all over the Ardennes, the Allies believed a major division-sized jump had taken place, resulting in much confusion and causing them to allocate men to secure their rear instead of sending them off to the front to face the main German thrust.